On this section of my series of JavaFX tutorial, we will be showing on the form creation which is very common in developing a desktop application. We will be showing on how to layout the form, add controls, and events. For the rest of all my javafx tutorial, I will be using mostly netbeans thus if you have not installed it yet, please do so. If you have not yet created your first application in JavaFX, it would be better to start in Hello World tutorial first which serves as the foundation in creating more advanced application. 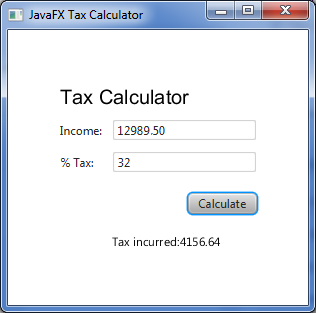 Create a new JavaFX Project and named it TaxCalculator. A TaxCalculator.java will be generated automatically and it will show the hello world template. Now we have to decide what to use as a layout on our form. Since the GridPane Layout provides a flexible grid of rows and columns which we need in layouting the controls. Moving back on our TaxCalculator form perform the following after the setTitle on start method. Set the padding. Make a note that the padding are spaces around the edges of the GridPane. The Insets follow this order; top,right, bottom, left. Let’ set 25 pixels on every side. Now initialize the scene and also its size. First and foremost we have to add a welcome text by adding the following after the initialization of scene and before the setScene code. After adding the title text, we have to add the label Income and it’s corresponding textField. Make a note that we are adding these elements using the pane.add(element,column,row). The counting of rows and columns starts at 0. Now that we have the fields layout on our scene, we now add the control button to Calculate the Tax incurred. Add the message text where the result (tax incurred) would be displayed. The code fragment above basically the action taken when the button is pressed. It calculate sthe tax incurred and display it on the taxMessage Text element. Since we are getting and parsing the values of the textField totalField and percentField, we need to make the declaration final. 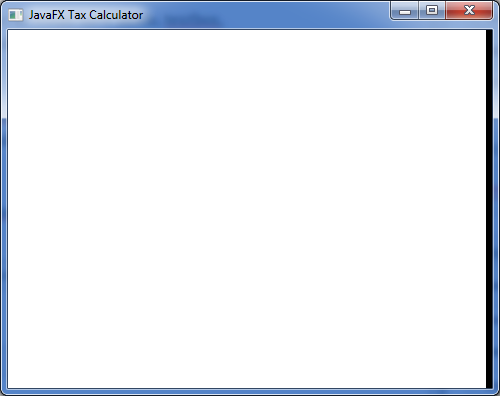 Please see below the full source code of JavaFX Tax Calculator.